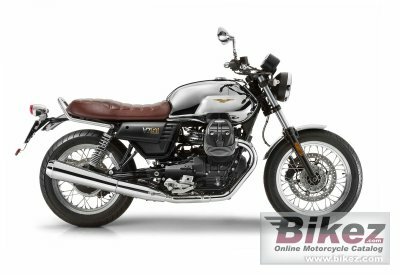 2018 Moto Guzzi V7 III Anniversario. Picture credits - Moto Guzzi. Submit more pictures. The Anniversario�s locking fuel cap in made from billet aluminium, along with the steering yoke risers that bear the laser incised model serial number. For additional customized looks, the V7 III Anniversario arrives with brushed aluminium mudguards, chrome-plated steel rear grab handle, and wheel rims featuring polished channels and grey hubs. Price as new (MSRP): US$ 9990. Prices depend on country, taxes, accessories, etc. Ask questions Join the 18 Moto Guzzi V7 III Anniversario discussion group or the general Moto Guzzi discussion group. Bikez has discussion forums for every bike. View comments, questions and answers at the 2018 Moto Guzzi V7 III Anniversario discussion group. You can sign up for e-mail notifications when other riders answer you. If you have extensive experience with the MC, please send us a review. If you consider buying this bike, you should view the list of related motorbikes Look at photos. Compare technical specs. And check out the rating of the bike's engine performance, reliability, repair costs, etc. You can compare the rating with other bikes.